Alas, it’s also the cue most under-rated. I see riders disregard the suggestion immediately. It’s like they want a real tool that works every time, not some airy-fairy imaginary, breath-y thing. They want a magic body position or a leg aid that gets dramatic results, like a spur with an electric cattle prod attachment… only kinder and more compassionate. Something that commands respect and undeniable leadership, not some puny suggestion to just breathe. Such an insignificant suggestion barely warrants a try. Well, not to horses. Breath is the universal animal language. It’s the initial tell-all greeting between animals. They size us up by the way we breathe and the emotions carried in our breath. It is a major part of leadership, communication, and relaxation in the herd. We are prone to diminish the horse’s behavior from taking intuitive stock of who we are, to begging for a treat. But then our sense of smell usually doesn’t even point out manure before we step in it. However we try to depreciate their greeting, they sense so much more about us than what we had for lunch. When our breath is shallow, our chest is inhibited and tight, sometimes even concave, with a tight jaw and tense eyes. It sends a message of restriction, fear, resistance. Our movements can even seem coyote-like in a stalking, nervous way. Clearly we not leadership material. A change in breathing is the very first message a horse sends his rider that things aren’t okay. When we see a horse taking shallow breaths, we know he’s tense. That’s our cue; we seize up to a flat, shallow breath ourselves. The horse feels that concern and as a prey animal, and looks for the source of trouble. Then his poll gets tense in the process and his oxygen intake is impacted. His head comes up and our shoulders get tight in response, along with our hands on the reins. He feels restriction on his bit, and now he’s sure there is a problem, so he loses forward, which is exactly like losing confidence. Then the rider either gets more tense or more adversarial. You can see where the ride is headed by now, right? There are a million outcomes from here, but it all started with breath. Breathing was the first cue and it doesn’t matter who started it, good or bad, the horse or the rider. In the end, the mood was set and the leadership defined in the first few seconds by breathing. But if we do manage to breathe, our chests expand and our vertebrae re-align. Muscles soften, jaws relax. Elbows unlock and legs get long and soft. Oxygen gets to our brains and we think more clearly. Communication is calm, responses acknowledged. Our body cues softness and rhythm. A horse will follow us on this ride too. Breath shared with a horse is an actual, literal cue either to relax or come apart. Now is it worth paying attention to? Uh-huh. Breathing is also the thing that can bring a horse back. If your brain panicked or lost focus, if you notice that things have sped up -and you’re being more reactive than proactive -and the clock ticking is getting louder, faster, -and things are a bit out of control… Slow it all down with your breath. Whether your mind has an anxiety runaway or it just wanders away from your horse to those pesky thoughts of self-doubt or frustration or what a lousy day you had at work, shut all that negative chatter down with a breath, just a disciplined breath. Yes, they make drugs for that. Breathing seems like a lame suggestion in the face of the pharmaceutical universe, in the face of a training wreck or world angst. It can even seem insignificant standing next to a horse. That doesn’t make it any less of a miracle. I like 1- 2- 3- breathing. It’s simple. Count to three on an inhale, let the air inflate your ribs in all directions, let it rest in the bottom of your belly for a count. Then exhale slowly and count to three. Do it in rhythm with your horse’s stride. Breathe into all the tight spots, up to your eye brows and down to your ankles. Breathe into your horse’s spine, to the tip of his tail, into his very heart. Perhaps you’ve noticed that talking to yourself about being in the moment with your horse isn’t the same thing as authentically being in the moment. Breath is the how-to aid, the thing that fills the gap between thought and reality. I have never met a horse that didn’t respond. Learn to discipline your breathing so you can have a better ride with your horse, and let your blood pressure benefit as well. All bad things for a horse happen with a loss of rhythm: Spooking, bucking, bolting. All good things things for a horse happen rhythmically: Trotting, grazing, breathing. And when they relax, they give a big blow from deep inside. We can learn it from them. Drop your shoulders and let go. Breathe deep, expand those ribs to give your generous heart room, then exhale peace. Inhale. What if we stopped fighting ourselves and suppleness became our greatest strength? Exhale. A deep breath is an act of confidence in itself. It isn’t the least you can do, it’s the very most. Keep breathing. Yet another timely, important article to share. (and read over slowly again after work!) thanks for reminding me I forget to breathe am always tense. I don’t want to be the stalking coyote, must be the leader.Feels good to breathe. Easy to forget, nice to remember. This article is worth printing out on a large banner and posting it in the tack room or barn door! I learned about breathing deeply and slowly about 10 years ago, and it literally saved my life while teaching my last — very reactive — horse both with ground and under saddle skills. He could launch into a full bore linear panic at the slightest hint of something new or out of place, and by meeting his energy level and then breathing deeply and slowly, he would reenter left brain thought processes. I’m too old to tackle another such horse now, but still use the “breathing therapy” with every horse I meet. You are so very, very, right, Anna! Breathing is the appropriate introduction, perfect training aid, and confidence builder for both horse and rider. Great article. I also find singing in a low voice relaxes me and my pony. I see his ears listening to me, I have to concentrate on the words and we both relax. Of course, he is tolerant of my singing skills and choice of songs. Born Free and America the Beautiful are our favorites. I like the singing and humming suggestion, just speed reading your article again, and I noticed a reaction, something that often happens when i read your articles. I confess, I get briefly a little teary, not boohoo just watery eye. I said to myself, why Nancy? Am I sentimental old whatsitsname. Then I realized I don’t exactly know! Is it because your articles are often of things that i’d like to take time out to do but forgot long ago about just how to, what would be second nature if… if what, we lived in a kinder more old fashioned slower pace place, didn’t try so hard, -maybe it’s because you reach down deep with your writing Anna. Is it because your writing is gentle, real,- not afraid to mince words but the underlying message is good and kind and respectful to our four legged friends. Just shared with two friends who need to remember to breathe and will share with my sons and more. thanks Anna, look forward to your name in inbox. Nancy, thank you for the heartfelt comment. For what it’s worth, I had a busy city life and landed here after a crushing mid-life crisis. Best thing that could have happened… Thank you so much for reading and commenting. Singing (automatically brings rhythm to the breath) has gotten me out of a few jams with my guy. I (we) enjoy when my one close neighbor isn’t around, so volume isn’t an issue – “Down to the River to Pray” is our favorite. Lovely, lovely post. Thank you. Singing, how could I forget singing!! Thank you for reading and commenting. Anna, this is such a great article! While reading, I found myself breathing to the rhythm of your writing. it was most interesting. Thank you for such a wonderful and important read. I’m a new horse owner (I adopted a 22 year old Tennesse Walker, Licorice) and didn’t realize the importance of breathing. thanks again! I did ride that way tonight. Licorice and I had the most amazing ride ever! thankyou! Nina, thanks for saying so. It’s good to ride ‘together’. Amen. He is grateful! Wonderful to have the ‘power’ of peace! 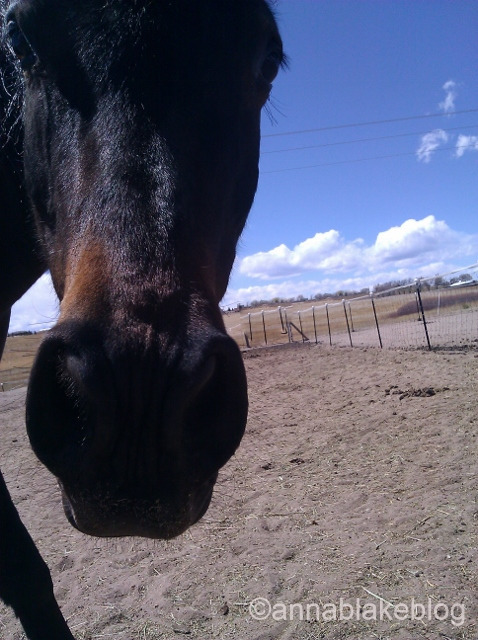 I’ve taught my project horse to transition downward when I breathe out more deeply then I usually do. It’s indeed one of the most subtle cues. I am the older green rider and trainer with no training experience, who adopted a troubled green mare. As you might imagine we often run in to stalemates while I am riding. She is not getting me and I am not getting her. When I realize we are stuck and both frustrated, I usually slide of her, gently lower her head until I can press my forehead against her forehead and we just stand there and breathe. I quietly tell her how much I love her and I will try and do better. Always at some point she let’s out that deep, precious breath that only happens when a horse is totally relaxed and I do that as well. I tell her I am sorry we had a misunderstanding, climb back on and 90% of the time we get back in the grove. She continues to be my teacher. Thanks for the great post. Not too green. You seem to know more than lots of riders, if you ask me. Thank you for the comment. Your mare says thanks too.